Due to the many requests, I am now offering some of the parts I use on my guns for sale. I will add more parts as I have them available. I have most of the typical small parts as well, bolts, screws, sights, touch hole liners, ramrod tips, etc. The sheet brass parts my seem expensive but they are cut, filed and shaped by hand using .050" thick brass just like the originals. These brass parts were taken from originals in my collection that were dug up in Virginia at several 18th century sites. 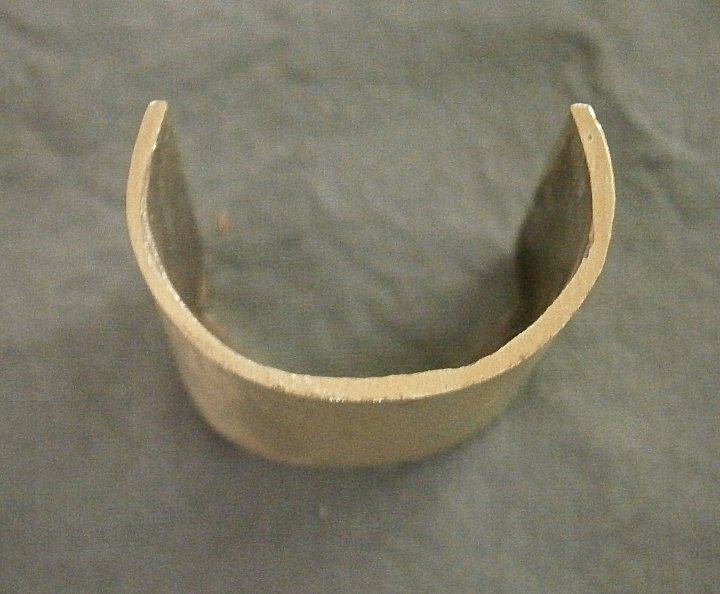 Similar parts have been found at 18th century sites from Georgia to Michigan. Examples are also pictured in T.M. Hamilton's book "Colonial Frontier Guns". Engraving examples can be found in T.M. Hamilton's book as well. Another good book on trade guns is Ryan R. Gale's "For Trade and Treaty". This is the one I use on my Type G and Early English trade guns. None of the originals were engraved. Measures 10" long. Bow is 1½" deep and 1" wide. This was also taken from one dug up in Virginia. Another is in Hamilton's book. Both are stamped "I Buttall" on the backside. None of the originals were engraved and all were nailed to the stock. Measures 5" tall and 1⅞" wide. Tang is 2½" long. In the 18th century the letter 'I' was often used in place of the letter 'J'. This cut down on the amount of printing press type and punch stamps necessary. Like reversing a '6' to make a '9'. These were typically nailed to the stock and the top tang was engraved. Does not come engraved as that needs to be done after fitting. This was taken from two surviving trade guns. 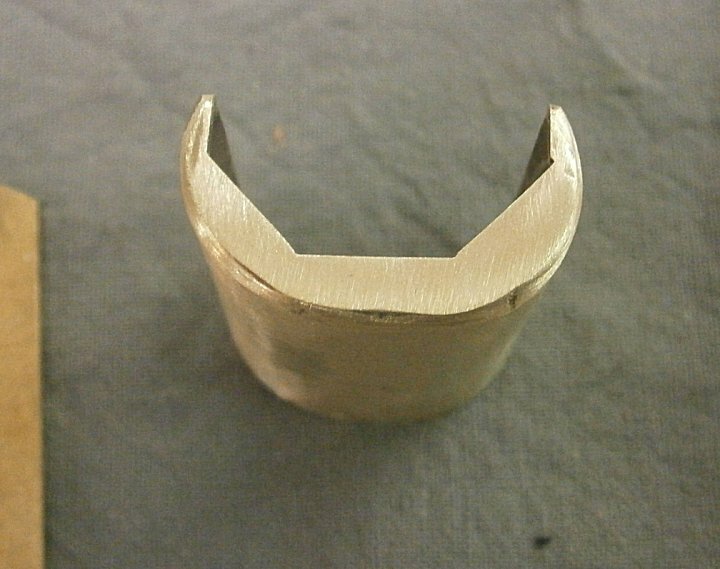 Cast in brass and made to fit a 1" barrel with a standard ⅜" wide dovetail. When placed about 4"-6" from the breech it works amazing well. As cast. The top one is used on my type G guns, the bottom one on the Early English guns. The bottom one is slightly earlier in style than the top one. All of the originals were engraved but I haven't seen any two engraved the same yet. Designed to fit locks with a 3¼" bolt spacing. Does not come engraved as that needs to be done after fitting. Made from .015" brass and 1¼" long as were the originals. The ribs look nice but also give them strength. Often these were inlet all the way through the wood and the tabs bent over in the barrel channel eliminating the need for pins. Typically use two on barrels up to 42", use three on longer barrels. This is the most common style found. Usually nailed to the stock with a nail at top and bottom. Always engraved. These do not come engraved as that needs to be done after fitting. Measures 2" tall and ⅞" wide. Taken from an original English fowler. Has a threaded lug on the back to attach it to the stock by use of a bolt coming up from under the guard. 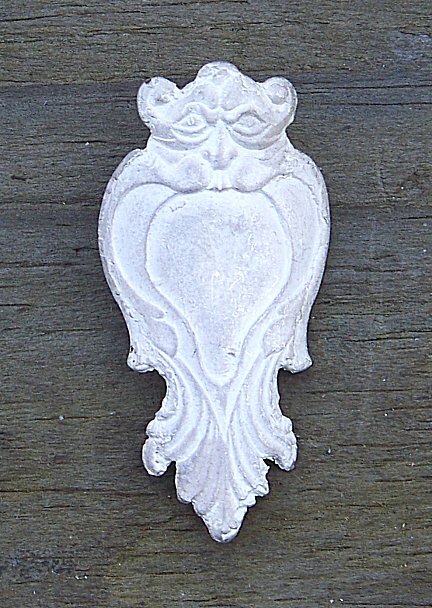 Measures 1 7/8" tall and 7/8" wide. As cast. Same design but in brass. 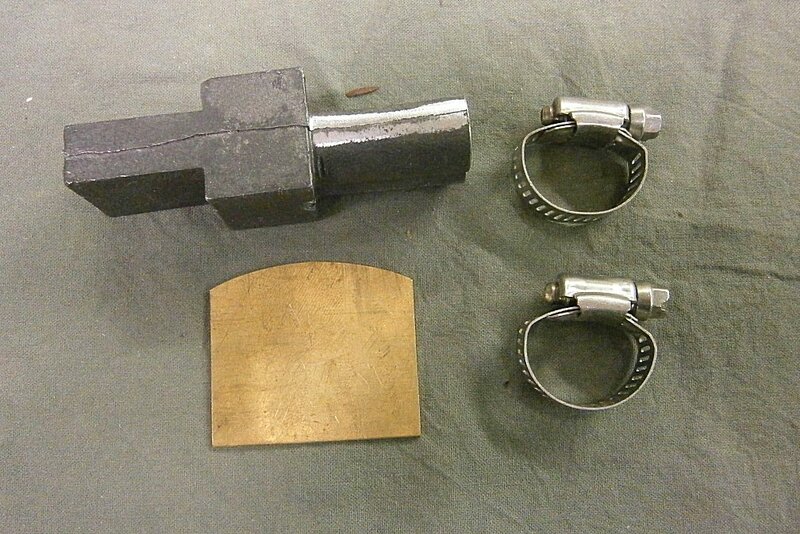 These are the parts for the Type G and the 1740 Early English trade guns in a do it yourself stage. Paper patterns are glued to a sheet of .030 brass ready to cut out and file. 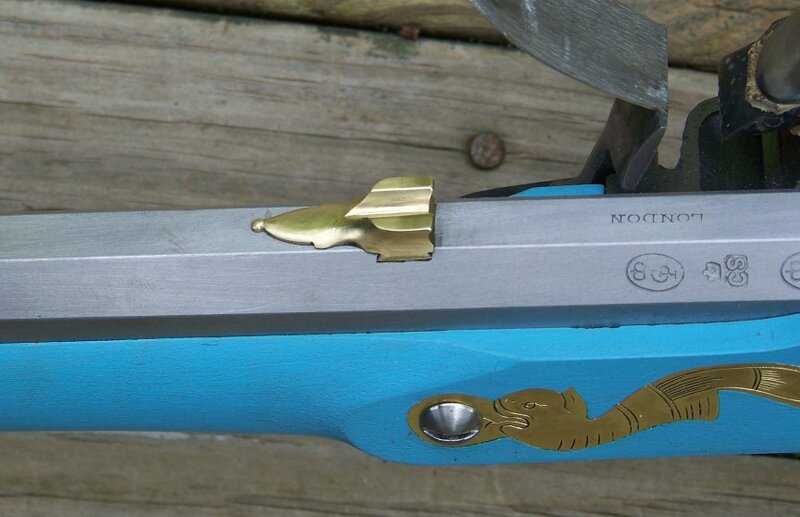 The buttplate and trigger guard will need to be annealed before they can be bent to shape. You will still need a set of thimbles as well. These patterns have been taken from original parts that have been excavated at an armory site here in Virginia that was active during the Revolutionary War. 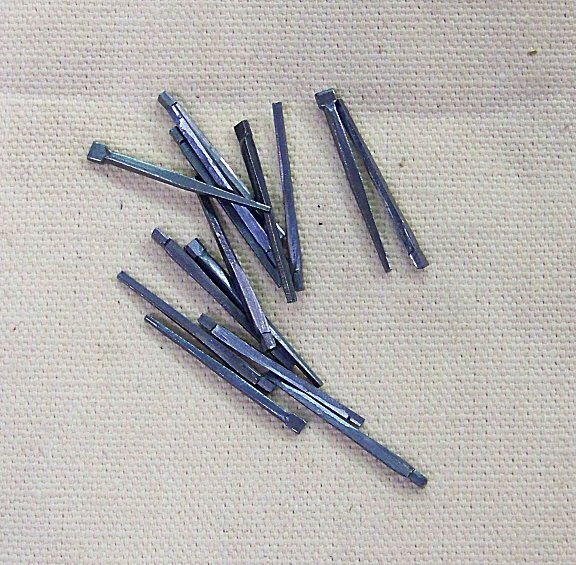 Brads: These round-headed brads are popular for cabinet work and selected furniture applications. They are 1" long 2d size. These are not hardened so the heads can be reshaped by hammering or the points can be clinched. 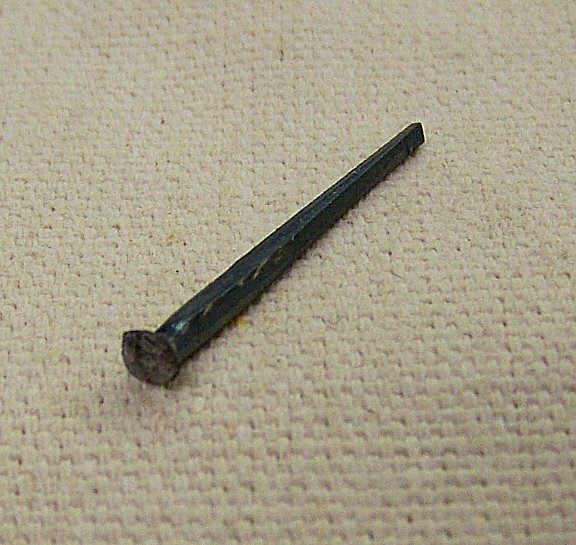 Clouts: Similar in design to Shingle Nails, but made from lighter gauge steel. Useful for box and crate construction, and for the application of thin siding and paneling. Also used for furniture repair, cabinet work, batten doors and counter tops. They are 1" long 2d size. These are not hardened so the heads can be reshaped by hammering or the points can be clinched. Sprigs: This pattern is used in wood applications where a slender nail will minimize splits. Often used for furniture repair, cabinet work and picture framing and casement work. They are 1" long and have a square head with a small shoulder. Perfect size for the wrist plates, a little small for the buttplates but work okay. The picture at the far right shows a sprig nail that has been held in a vise and the head quickly hammered into a flatter pyramid shape typical for the period. The buttplate pictured is held on with these hammered sprigs. Made of heavy cast steel to last for years. Comes with clamps and pattern for the nosecap. 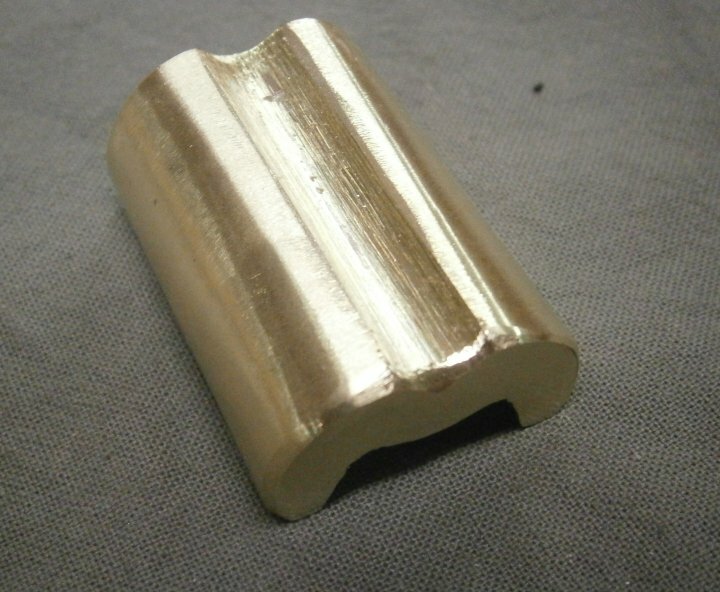 This will make nosecaps in brass or steel to fit 13/16" to 1" barrels. 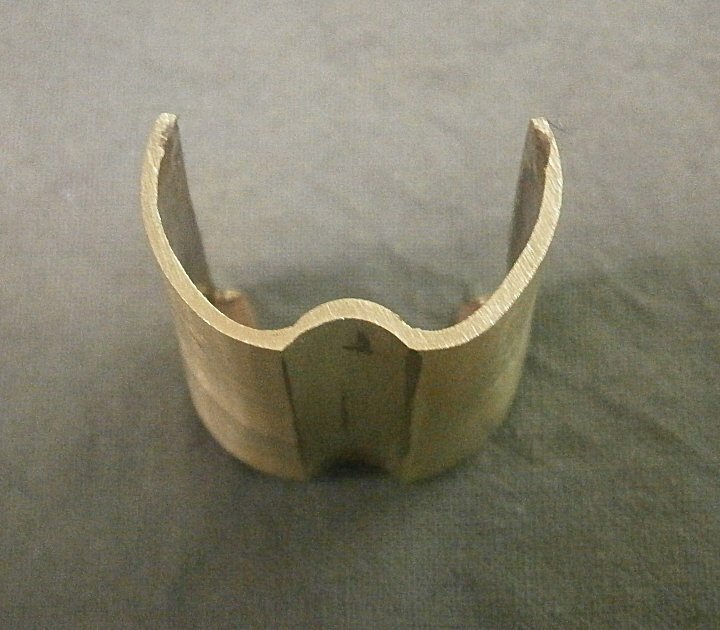 Plain or grooved styles can be made in about 20-30 minutes including the file work to fit it. Instructions with step by step pictures are included. Click here for instructions on how to use the form.